An outdoor garden shed can be a beautiful addition to your property. Garden sheds are structures that will add aesthetics and function to your property. Instead of throwing your rakes, shovels, soil, fertilizer, and equipment in a corner, you can eliminate the eye-sore and organize all your gardening tools at once with a well-built garden shed. If you have enough space somewhere in your yard to build a shed, the next step is deciding what type of structure you want to build. If you are willing to dedicate the time, sweat, and tears, you can take on building the foundation and the structure as a do-it-yourself weekend project. Before you start downloading garden shed plans, know what you should consider and make your weekend project easy and systematic. Before you start building any detached structure on your property, you should check with the city zoning board to verify whether you need a building permit. Getting a building permit is extremely easy. You simply fill out an application, give the city your money, and you receive approval to build a structure that satisfies city codes. If you choose to cut corners and build your structure without a permit, your small affordable project could quickly become an expensive legal mess. 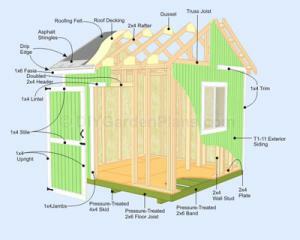 Avoid fines and make sure your structure is legal before you search for garden shed plans. You may have mapped out where you plan ton build your foundation. Before you lay out the foundation and the concrete, be sure you have weighed the pros and cons of the areas you are considering. How easy will the shed be to access? How close is the location you chose to your garden? Is there enough room to remove and insert large gardening equipment? Will the shed disrupt your priceless view? Will the structure be too close to your neighbors property line? Will your shed be susceptible to flooding during adverse weather conditions? If you fail to recognize the obvious you may start building and change your mind down the line. When you start considering the design and usage of the structure, plans will become very important. You must consider what you plan to store in your shed and whether or not you plan to invest in larger equipment in the future. If you have a push lawnmower but it has always been your dream to own a ride-on you should build a building that will cater to what you want for the future. Make sure you compartmentalize the inside of the shed so that you can keep everything organized and neat. Some anxious homeowners jump the gun and decide on a plan too soon. They may making a mistake and do not end up choosing the right garden shed plans. If you believe in planning and preparation, make sure to consider the information above. Once you plan your project, you can make a wise decision, and choose the best layout and design for your home.